Dumur or Hairy fig (ficus hispida, family: moraceae) is a medium-sized tree from ficus genus with branches. The hairy-leaved tree is native to Bangladesh, as well as South and Southeast Asia and New Guinea, Australia and Andaman island. Figs are eaten as vegetables in Bangladesh and India. Flowers remain inside fruit and cannot be seen from outside. Fruits called figs grow in cluster on branches. The ripe fruit is yellow. Ovulate green leaves are hairy and rough. Leaf is 12-18 cm long and pedicel is 2-5 cm long. Common names: Dumur, Kala dumur, Kak dumur, Devil fig, Hairy fig, Opposite-leaved fig-tree, Rough-leaved fig. Its propagation is by seeds. Figs are used in stomach-ache and constipation. It is also used to cure different teeth diseases. Ripe fruits are eaten by birds and seeds are spread with their droppings. The plant grows in wilderness and fallow lands. It can be seen everywhere in Bangladesh. The species name 'hispida' derives from its hairy leaves. Til, Sesame (sesamum indicum, family: pedaliaceae) is an annual herb with hollow stem and branches attaining a height of 50 to 100 cm. The plant is originated in Africa. It is cultivated as crop throughout the tropical world. Leaves are opposite, broad lanceolate,dark green, 4-14 cm long with an entire margin. Sesame or Til seed is one of the oldest oil-seed crops of the world. Flower is hairy, white or light pink, borne on leaf axil; 3-5 cm long with a four-lobed mouth. 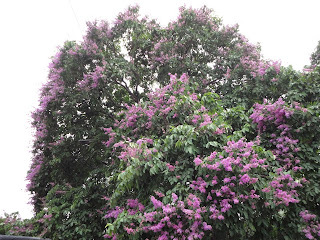 In Bangladesh, it blooms generally in April-May. Sesame fruit is a rectangular capsule, 2-7 cm long, covered with tiny soft hair. Tiler khaja, a type of sweetened food made from sesame seed is very popular in Bangladesh. Propagation of the plant is caused by seeds. Seeds are usually off-white in color. Sesame is energising, carminative and diuretic. It increases breast milk and sperms in male. It has been found useful in dyspepsia and dysentery. Oil extracted from seeds is used on skin. Amra, Hog plum, (spondias pinnata, family : anacardiaceae) is a medium-sized deciduous tree with soft branches. The fruit is well known throughout the tropical world for its sour-sweet pulp. The tree is found everywhere in Bangladesh. Common names: Amra, Anbra, Hog plum, Spanish plum. Flowers are small, greenish white, on strong inflorescence. Flowers bloom in cluster on leafless branches in February-March. Male and female flowers bloom on the same tree. Leaves are compound; leaflets 7-13, oblong, 7-15 cm long. Leaves are also taste sour like its fruits. The fruit is a drupe, 4-10 cm long, egg-shaped, smooth, single seeded; green when ripe and yellow or orange when ripe. Fruits ripen in July-August. The bark, leaves and fruit of spondias pinnata are used in dysentery, stomach aches, ear-pain, decay of teeth. Tasty chutney is made from the fruit. Spondias pinnata is mostly found in South and Southeast Asia. Verenda or Castor bean (ricinus communis, family: euphorbiaceae) is an evergreen large shrub that reaches 5 meters tall. This fast growing plant is native to Northeastern Africa and the Middle East and become naturalized almost everywhere─in tropical or subtropical area of the world. Common Names: Verenda, Shobuj bherenda, Castor bean, Castor oil plant. Fruit is a capsule, egg-shaped, 3 cm long, covered with soft spines. Fruit bears three poisonous seeds. Leaves are green, finger-like lobed, ends are narrow. Edible oil is extracted from seeds. Cotyledon is highly purgative and emetic. The plant produces flowers from March to August. Brancy inflorescence bears small greenish flowers. Propagation of the plant is caused by seeds. It is grown in waste places or homestead for the seeds. Ricinus communis grows in waste places, fallow fields, along road shoulders and at the edges of cultivated lands in Bangladesh. Tetul or Tamarind (tamarindus indica, family: leguminosae) is a large evergreen tree, with spreading canopy about as wide as the tree's height. It can get a height of 30 m but is usually less than 20 m. It is native to tropical Africa and become naturalized in the tropical world. The tree is grown in Bangladesh as ornamental tree, and for the edible pods which pulp is extremely sour in taste. Leaves are compound; leaflets are oblong, 10-18 pairs, small, linear, 0.4-3.2 cm long and 0.3-1.1 cm wide. Tamarind trees are slow growing but long lived, with a 200-years life span. Flowers borne in small drooping clusters. Buds are red, sepals 5, yellow on the inner side. Petals 5, unequal, 1-1.3 cm long, pale yellow or cream-colored, with red venation marks. Arjun or Arjuna (terminalia arjuna, family: combretaceae) is a medium-sized semi-deciduous tree, of about 20-25 m height, with many branches. The tree is native to Bangladesh as well as Indian subcontinent. Common names: Arjuna, Arjun tree. Propagation is caused by seeds. Flowers, on spike inflorescence, are small and whitish yellow. They bloom in the months of April and May. Bark is thick, whitish grey, smooth and loose. Leaves are simple, green, elliptical, 8-11 cm long and 4-6 cm wide, without petiole, alternate. Its fruit becomes 2.5-3.5 cm long. Its bark extract is used for cardiac diseases, as it contains tannin. Leaves are used for urinary disease, wound, dysentery, fever and pain.